The first step in successful manure composting is to measure the amount of waste generated each day on your farm. 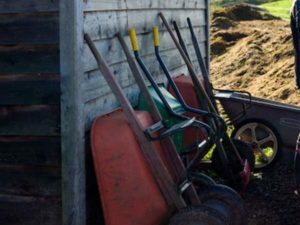 Measure the volume of your wheelbarrow and post a chart on the wall of your barn and mark off each time a wheelbarrow load goes out of the barn. Be sure to do this for a week as there can be differences, especially if there are different people cleaning stalls on different days. Calculation 1. Daily manure production for horses = number of horses x horses’ daily manure production rate. This can be calculated using the interactive calculator in Step 4.